Costa Rica weather map. March is the dry season and the weather is fine across the country. Early March is definitely a good time for a Costa Rica vacation (see our favorite routes). The most popular destinations have hot dry weather and many hotels and lodges have some rooms available even a couple of weeks ahead. Later in March Spring Break travel may reduce availability and raise prices. Wildlife comes out in March to enjoy the sunshine and gathers at shrinking water supplies as the dry season stretches out. 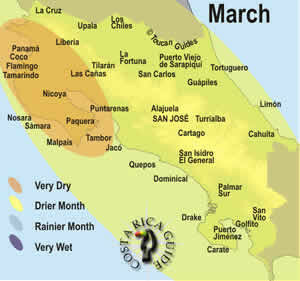 March is the heart of the Costa Rican dry season. The western and central regions of Costa Rica have sunny weather, nearly no rain and surprisingly low humidity. The tropical dry forests covering the lowlands of Guanacaste and the Nicoya Peninsula have dropped their leaves and some are flowering in spectacular displays. The Costa Rica Time Machine matches your vacation time with the best destinations and vice versa. March through April is the hottest weather of the year on the Pacific side of Costa Rica. Highs around 86 to 96 °F (30-37 °C) and low temperatures of 76 to 86 °F (25-30 °C) keep the beaches sizzling and there’s nearly never any rain to cool things off. Average temperatures 2-3,000 feet higher in the mountains are 75 to 85 °F (24-29 °C) during the hottest part of the day and it cools off more at night. You may want to consider a few days in the high elevation cloud forests of Monteverde, Savegre or Los Angeles where temperatures are even lower. March is also a drier months on the Caribbean coast but this region is covered in lowland rain forest that never experiences the dry dusty conditions that prevail on the Pacific north during the dry season. Rains still cools things off many afternoons and average daytime highs are 80 to 88 °F (27-31 °C). The weather is perfect for surfing and even though the northern Pacific surge is smaller than the southern that sets up later in the year offshores keep the waves consistent see regional surf descriptions for March. The hurricanes in the Caribbean Islands in 2017 increased demand for Costa Rican beach destinations in 2018. Looking at early reservations 2019 looks even busier and most of our favorites had less than 10% availability remaining for March three months in advance. We normally tell people that if they’re flexible they shouldn’t have any problem winging it without reservations in March but maybe not this year. Make reservations on your own or with a qualified travel planner who may have expanded availability compared to online booking sites but make reservations. Many popular places (especially in beach areas) have minimum stays of 3-6 nights for the peak season. Easter and the preceding week (Semana Santa or Holy Week) are the busiest time on the Costa Rica travel calendar but since it’s the third week in April (April 21, 2019) it should not impact March travelers next year. If you want the flexibility of traveling without reservations you may not get your first choice in March, but with a good guidebook you should be able to find something – plan on looking for accommodations in the morning. Airfare rarely goes on sale for the peak travel months but if it does it’s usually several months in advance. If you plan ahead and set a fare alert on a search site like kayak.com there are occasional bargains – In 2016 there were tickets available for less than half price as Southwest, Jet Blue and Spirit had all introduced new routes. In 2019 the damage in the Caribbean Islands may drive up prices to Costa Rica as more travelers switch. The weak El Niño which developed in January is expected to persist into March 2019 which typically means slightly below normal rainfall in Costa Rica. Costa Rica was not affected by the hurricanes that devastated the beach vacation destinations of the Caribbean in the fall of 2017. Tourism is experiencing a second year of rapid growth as people shift away from the island destinations. approximate exchange rate ¢606 per $U.S.